This story is the first in an ongoing series about the last days of desegregation. The Coleman Report became legendary, fueling and informing debates that are still raging today. But no one gave away River City’s identity, or kept track to see if its promise came true. Did the town’s good-intentioned integration plan succeed in bringing a deeply divided community together to improve education for both black and white students? The town, it turns out, was Greenville, an unusually diverse community of blacks, whites, Chinese, Creoles, Jews, as well as immigrants from Lebanon and Syria. Home to more than 12,000 public school children, the district was the first in Mississippi to defy the governor and voluntarily offer real choice for white and black children to enroll in each other’s schools. This was not Grenada, Mississippi, where angry white residents beat black elementary school children with pipes and fists for trying to enroll in that town’s token “freedom of choice” plan. Nor was it Yazoo City, where the White Citizen’s Council strong-armed 53 black citizens for signing an NAACP petition endorsing integrated schools. Some were fired from their jobs, others evicted from their homes; all were refused service at the town’s white-owned grocery stores. Greenville took pride in its reputation as a city apart. By 1977, the U.S. Civil Rights Commission declared Greenville’s desegregation to be a near total success, not just in deeds, but in hearts and minds. 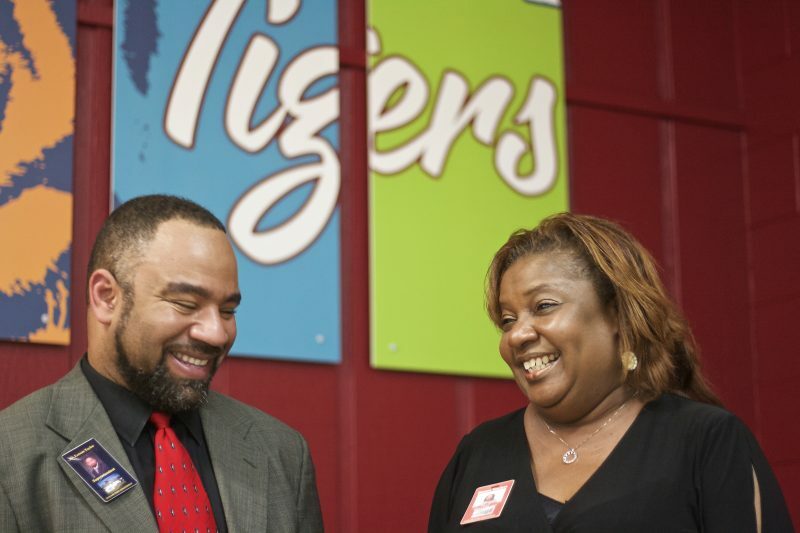 “Good leadership and good will” had created a district where “not one school was left with an all-black student body.” A few bubbles of trouble percolated. About 2,000 students had left by then. A newly opened private academy called the Washington School had claimed about 15 percent of the white children. The black community expressed dismay that all symbols of black accomplishment — plaques, citations, trophies, and class pictures — were removed and tossed aside when the all-black Coleman High School was converted into an integrated middle school. Still, the Commission held, the majority of Greenville’s citizens — planters, business folks, community members — all understood that they were better off with diverse, unified public schools. What happened next in Greenville, a de-evolution of sorts, is a lesson for another Mississippi town, Cleveland, now wrestling with a federal court order to merge its historically black and white schools — and a warning siren for the rest of the nation. A recent government survey showed that segregation by race and class in the nation’s public schools is getting worse, not better. This is in large part an expected result of demographic, rather than policy, shifts. In other words, it is taking place at the same time that black and Hispanic children have become the majority in the nation’s public schools. But what’s more, a 2016 Stanford study found that poverty is rising faster in predominantly minority schools than in white schools. Meanwhile, years of research underscore what the Coleman Report pointed to 50 years ago, a real correlation between segregation and an educational achievement gap along lines of class and race. In fact, a 2006 re-analysis of the original data, using more sophisticated statistical techniques, found that schools with concentrated levels of black and poor students do even more harm to black students’ achievement than Coleman originally conceived. The collapse of Greenville’s integrated school system not only shows how fragile racially balanced schools are, but also why they’re surely worth protecting. In Greenville, the federally approved desegregation plans of 50 years ago were nothing if not a sincere attempt to achieve total integration. The current Greenville school superintendent, Leeson Taylor, was a student at Greenville High at the tail end of those heady days. Born in Gary, Indiana in 1971, Taylor moved to Greenville when he was 5 years old to live with his grandparents, one a school cafeteria manager, the other a retired Pullman railroad worker. His 26-year-old mother had been killed in Indiana, allegedly by his Jamaica-born father, who was never caught or convicted. The schools were so egalitarian in the early ’80s that one of his elementary school classmates was Roy Percy, descendant of Greenville’s legendary white planter family. The patriarch, Sen. LeRoy Percy, was famous for driving the Ku Klux Klan out of town during its heyday in the ’20s, convincing townspeople it was nothing but a fascist band of hoodlums. When Taylor graduated from Greenville High School in 1989, there were still enough white students, barely, to fill the mandated balance for positions of responsibility. Taylor was the black class president, so his vice president had to be white, by design. When he returned from college in 1993 to work as a history teacher in the district, he wondered where all the white students had gone. Today, all five of Taylor’s children, ages 5 to 28, went to, or are about to enter, Greenville’s completely re-segregated schools. Ninety-eight percent of the 5,300 students — down by more than half since integration began in earnest — are black and 94 percent live in poverty. Resources are scarce; qualified teachers are hard to recruit and retain. Mississippi’s state legislature has underfunded Greenville’s schools by roughly $21 million over the last six years. The district’s starting teacher salaries are among the very lowest in in the U.S.
Taylor remains undeterred by the mounting obstacles to success. “People say it can’t be done in the Delta. I just don’t believe it.” he said. The superintendent faces a long climb back. 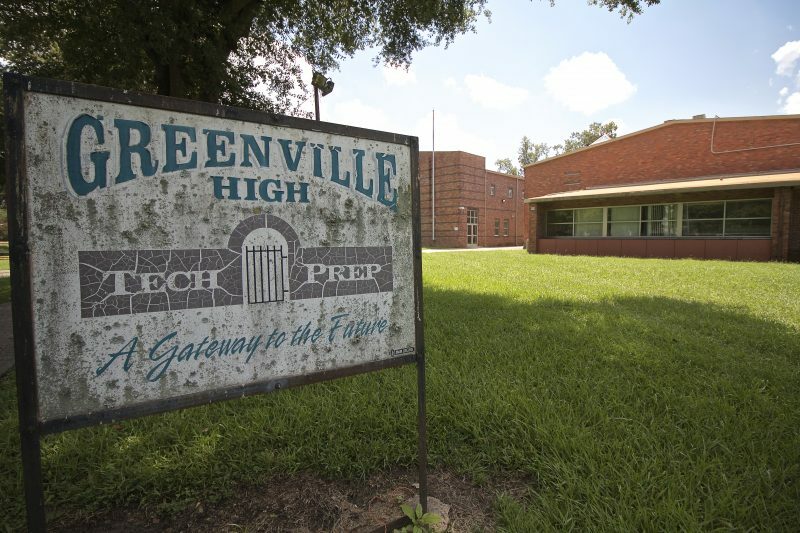 Greenville High, once a top high school in the state, struggled to pull itself up from the F status it received for many years from Mississippi’s state accounting system to the D it has now. Across town, the private Washington School charges up to almost $6,000 annual tuition and is 94 percent white. Eleven out of its nearly 700 students are black. 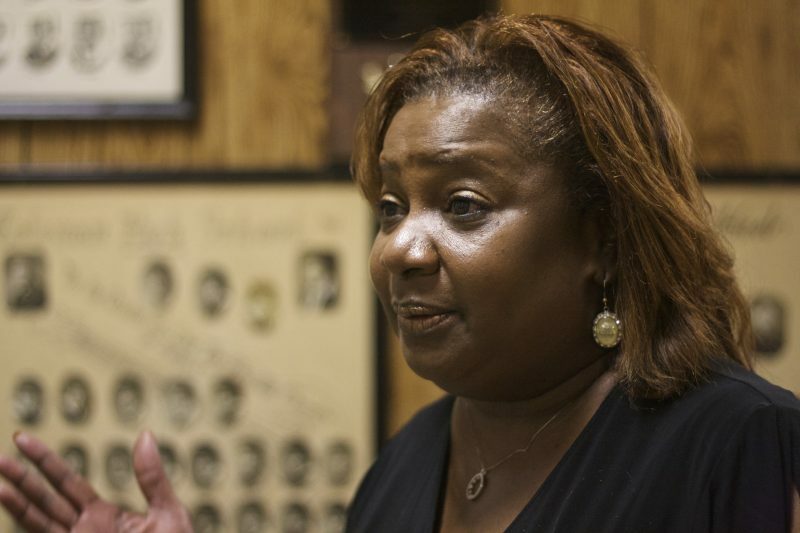 Merchant worries not only about her own town, but about the Cleveland district, where she believes families will find excuses to leave under a more aggressive effort to force white and black students together. The white families did in fact flee in Greenville, but not at first. 98 percent — Percentage of Greenville’s 6,000 students who are black; 94 percent live in poverty. The town, like most others in Mississippi, established two school systems by the late 19th century, segregated by race and wholly unequal in money, facilities and trained teachers from the outset. By the 1950s, Mississippi was spending three times more on white students than on black. By 1962, Greenville, despite its progressive reputation, was spending four times more on its white schools than its black ones. 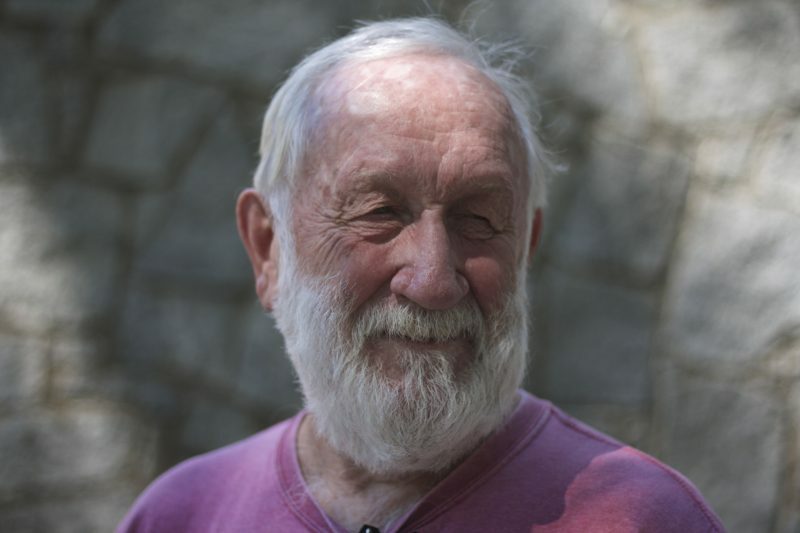 His son, Hodding Carter III, took over as the paper’s crusading editor in the early 1970s, tilting its editorial support to full school desegregation. Greenville’s economy was booming at the time. Alexander Smith Carpets had moved its mills down to cotton country to escape union regulations in New York. The largest tugboat builders in the country were set up along Greenville’s banks of the Mississippi River. The Stein Mart department store chain was founded in Greenville by a prominent Russian Jewish immigrant family. All are gone now. Uncle Ben’s rice company, a division of Mars, is one of the few industries that remain. Greenville caught the attention of the Coleman Report researchers in 1965 when its school board defied Mississippi’s segregationist governor, Paul T. Johnson, and the obstructionist White Citizens’ Councils to submit its own freedom of choice plan to the U.S. Department of Education. Commissioned by the 1964 Civil Rights Act to study the state of school inequality across the U.S., the nation’s top sociologist, James Coleman, undertook a massive survey of around 600,000 students in a little over a year’s time. The 737-page report, officially called “Equality of Educational Opportunity,” is still regularly cited, used by liberals and conservatives alike to serve their arguments, and is just as often misconstrued. Coleman expected to find that vast discrepancies in resources between black and white schools were the main reason for the achievement gap. Instead, he found that about two-thirds of the gap was likely due to family poverty and to race segregation. Providing lower class sizes and other resources in schools with concentrated racial isolation and poverty was crucial, but they did not make a big dent in children’s achievement. What did matter was integration. As incentive to integrate, the federal government offered emergency dollars to districts whose desegregation plans were approved. As disincentive, it threatened to withhold new Title I funds for disadvantaged students from districts that refused to comply. “We couldn’t afford the luxury of segregation,” school board chairman J. Barthelle Joseph, Jr. told civil rights staffers at the time. Greenville school board leaders proposed that students in four grades could choose among any of the district’s 16 schools. At first only a handful of black children — 147 all together, one-tenth of those eligible — chose to brave the all-white schools. No white children crossed over to attend the all-black Coleman High School, or any other black elementary or middle schools. Voluntary desegregation worked in only one direction. The Delta Democrat-Times played a significant role in shaping public opinion. “You had this overhang of an extremely vigorous newspaper editorial policy,” said Carter III. Its editorial pages promoted the view that Greenville was a decent, law-abiding town that followed the constitution. Integration was right and necessary, but a step-by-step approach was the wisest. As the Coleman Report went to press, though, Greenville’s black community was headed to court. Dissatisfied with the slow pace of change, local black plaintiffs filed a lawsuit in federal court meant to push for a faster timetable. A federal judge requested a new plan in 1969, to be put in place the following school year. By 1970, black and white children and teachers were fully integrated class by class, school by school. Town leaders put to use nearly every integration tool available to ensure a fair mix of students and teachers. Elementary school populations were merged, T.L. Weston became a 10th grade school, and Greenville High admitted all the town’s juniors and seniors. Black and white teachers were evenly distributed, zoning laws were changed and curricula were altered. Black History was added, busing was provided. This was not just lip service, but a real attempt to make it work. By all accounts, if the adults had left the children of Greenville alone, integration might have survived. Black and white students shared school leadership positions and leads in the class plays. One of the first valedictorians of the newly integrated Greenville High in the early 70s was a brilliant black student, Eddie Muhammad, who later enrolled in Harvard University. By the time Catherine graduated Greenville High in 1976, she could already feel the fabric fraying. Her white friends began to slowly and reluctantly peel away to private schools, parochial schools, boarding schools. Most talked about their defection in social terms, friends following friends. Parents and school officials didn’t allow integrated proms, dances, or any other school-organized social events until the early ’90s. Black students in town would hold dances at the VFW. White teens held parties in their homes. By all accounts, black and white students alike expected their youthful example of peace and harmony to eventually overcome the prejudices of the older generation. But scars from a relentless history of white and black educational inequity were not readily healed. 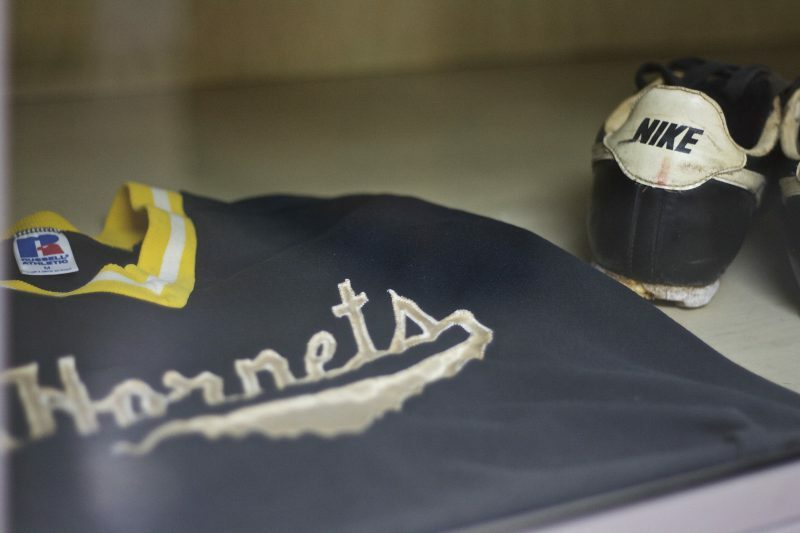 Inside a small, dimly lit room off the main corridor at Greenville’s Coleman Middle School, gold and silver sports trophies are crowded next to sepia photos of long-ago teachers. 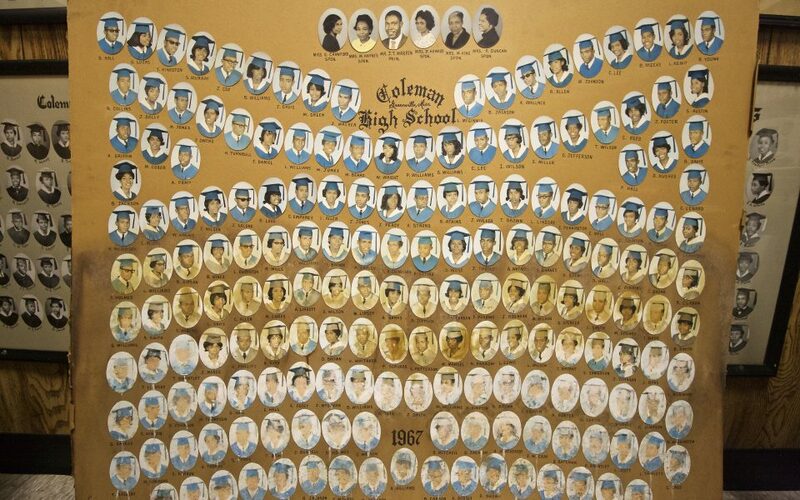 Behind, are framed portraits of graduating seniors dating back to the school’s storied beginnings as Coleman High School, one of the first in the Delta for black teenagers — a legacy the black community in Greenville was forced to sacrifice. “There’s a lot of pride, a lot of pride here,” mused Dianne Zanders, the school’s principal for the last nine years, as she peered into the locked glass door and searched, without success, for the key. The high school was founded in the ’20s at a time when less than one-third of blacks in Mississippi went to school past the fifth grade. A class of sixth graders in their burgundy and khaki school uniforms buzzed past, smiling, somewhat anxiously, as Zanders turned to welcome them back from spring break. State tests were coming up. Officials and teachers hoped to continue the improvement in scores that resulted in the school’s upgrade in state-standard status from an F to a C in the last year. Zanders was a Coleman middle school student herself in the 1970s, when about 30 to 40 percent of the students were white. “We all competed with each other, we all strived to be the best in everything,” she said. Today, the school’s 580 sixth through eighth graders are 99 percent black, 94 percent poor, and struggling for the last several years to climb from its bottom-level academic scores. The biggest need, she said, is a pool of qualified teachers who will stick around longer than a couple of years. The archive room is a recent addition, created at the insistent urging of the old high school’s alumni. Many still resent the mistreatment of their memorabilia over the years. When Coleman was converted into the town’s integrated middle school during the late ’60s, its trophy cases were dismantled, the school’s citations, banners, plaques and triumphs scattered willy-nilly. To many, this disregard showed an insensitivity by white leaders to the galvanizing role that Coleman High School played for Greenville’s black community. All symbols of blackness were cast away. The original high school opened in 1923 just off Nelson Street, historically the thriving African-American heart of Greenville’s business, life, and the heart of Delta music. The school was named after Lizzie W. Coleman, who was principal of the district’s segregated P.S. 2 on Theobald Street for more than 40 years. Like many black Mississippi educators, Lizzie Coleman had no college training. “I don’t understand why they would want to destroy Coleman like that,” said Davis Weathersby, 86, who was hired as a science teacher and coach in 1955. “It had so much pride and notoriety in the state.” Under his leadership as athletic director from 1956 to 1970, Coleman’s teams captured one national basketball title and twelve state championships in the varied sports of football, girls and boys basketball, and girls track. 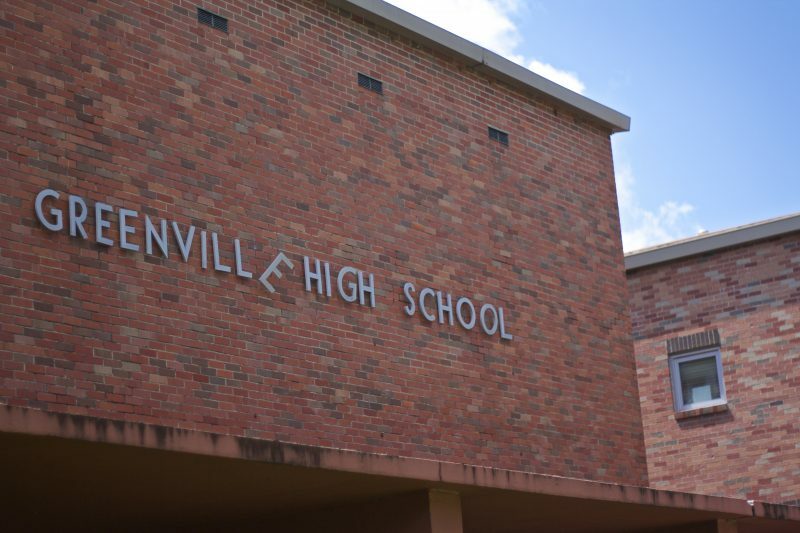 The seventh through 12th grade school enjoyed nowhere near the resources of the white Greenville High School across town. Textbooks were ragged, the gym barely adequate, the track was not regulation size. When Coleman High closed in 1970, the superintendent offered Weathersby a job in Greenville High School — a demotion to assistant football coach. “He told me Greenville wasn’t ready for a black head football coach,” said Weathersby, who held a master’s degree from Alcorn University, where he and Medgar Evers were football players. The superintendent wanted him to work under the Greenville High coach. “He hadn’t won a ball game,” Weathersby said. Stung, the proud coach declined the offer, and went on to become the athletic director at Mississippi Valley State University, where he was eventually honored by the Southwestern Athletic Conference as co-coach of the year. Black administrators across Mississippi were probably hit hardest by integration. In 1969 Mississippi had 168 black principals. A year later, there were only 19. “Greenville has never been the same since Coleman disappeared and the white private schools came,” Weathersby said. Bob Boyd remembers the day he believes the great promise of Greenville was upended. Boyd, a lifelong Mississippi civil rights worker, had landed his first job out of Ole Miss in 1968 as an education and court reporter for the Delta Democrat-Times. His editor, Hodding Carter III, got wind of a secret meeting at the Buster Brown Community Center, down the road from Greenville High School, and sent Boyd to cover it. It was several days after a federal court had decided in favor of the black plaintiffs who had pressed for a speedier desegregation plan in 1969. Some in the white population bristled at such interference. $6,000 — Tuition charged at the private Washington School in Greenville, Mississippi. The school is 94 percent white. Boyd poked his head in the door of the center, and stayed long enough to see it was packed to capacity, before he was shooed away. Somewhere around 200 white citizens were meeting to discuss opening the private Washington School. Washington School opened with around 320 students in the spring of 1969, the same year the district was shuttering Coleman High School. The private school now has a manicured campus and around 700 students, K-12, the vast majority white, 1.6 percent black. Tuition ranges from $3,800 to almost $6,000 depending on the grade. Other private school options, such as the nearby St. Joseph’s Catholic School, or Greenville Christian School, are more mixed racially, but are still majority white. Nell Sistrunk Schwartz, now a Houston clinical psychologist, was one of the private school’s first students in 1970. “My parents told me I would be going to Washington School, and that was all there was to it,” said Schwartz. “The party line was that we would get a better education at Washington. It was gauche to say anything different,” she said. 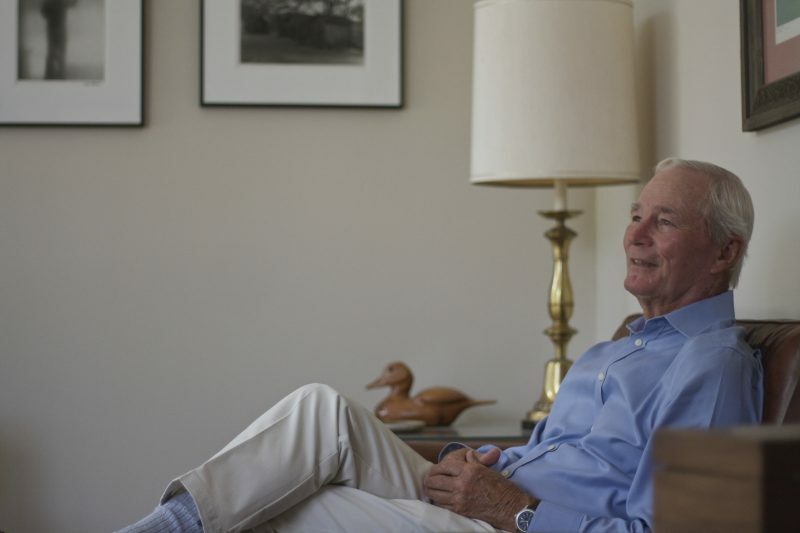 “I hated every day of that school.” Schwartz left Greenville in 1973 to go to college and never came back. The authors of the 1977 Civil Rights Commission report noted that a key goal for Greenville was to lure the 15 to 19 percent of white kids who had left for private alternatives back to the public schools. Instead, a trickle of defections became a steady current. Looking back, William Percy Jr. wondered what Greenville would look like now if the slower, steadier form of school integration had continued to run its course. White families might not have fled over social concerns. “What that tells me is that if we had left the system alone with freedom of choice we may very well have had a better outcome than we’ve got now,” said Percy. Others believe re-segregation was inevitable, once whites felt they were no longer in charge. When members of the old, stable town leadership began to leave, citing a need for “quality education,” the die was cast. A gentle arch leading up to the levee reminds people that the town in its halcyon days was the “Queen of the Delta.” Its downtown was listed two years ago in the National Register of Historic Places. Two wide boulevards, Main and Washington Streets, are lined with occasional grandeur — a neo-classical bank, a gothic revival Catholic Church, one with Italian marble, the other with German-crafted stained-glass windows. Amidst such relative elegance now exist papered-over storefronts with names like Toxic Bar and Grill, Nothing Over $10, and Jesus Is Lord for the Greater Delta. Other buildings are boarded up. The general exodus from Greenville is palpable. Its population is down to under 33,000, 77 percent black, 21 percent white. Poverty is among the nation’s worst: 47 percent live below the poverty line; the median household income in $27,000. It’s impossible to untangle all the reasons for the decline. Whites departed at a much faster rate than blacks during the upheaval in the ’60s — perhaps because they could afford to relocate. Industry left, in part for cheap overseas labor, but the decline in the public school system as it became more segregated may have also made it a less attractive home base. This is what’s at stake up the road in Cleveland, and in other communities across the U.S. where there’s enough racial diversity to make integration still a tenable, if fragile option: places such as New York City, Madison County, Alabama, and Louisville, Kentucky. Integration usually forces people to make sacrifices. But the fallout of segregated schools is often worse. The re-segregation of the Greenville schools didn’t just mean a decline in the town’s academic standing as middle class whites fled to their own schools. It coincided with the end of the town as both black and white families once knew it. In Greenville, those still remaining are dedicated to a revitalization, despite the obstacles inherent in trying to make separate equal. $172 million — the amount the Mississippi legislature shortchanged its education funding commitment. $1.9 million would have been Greenville’s share. 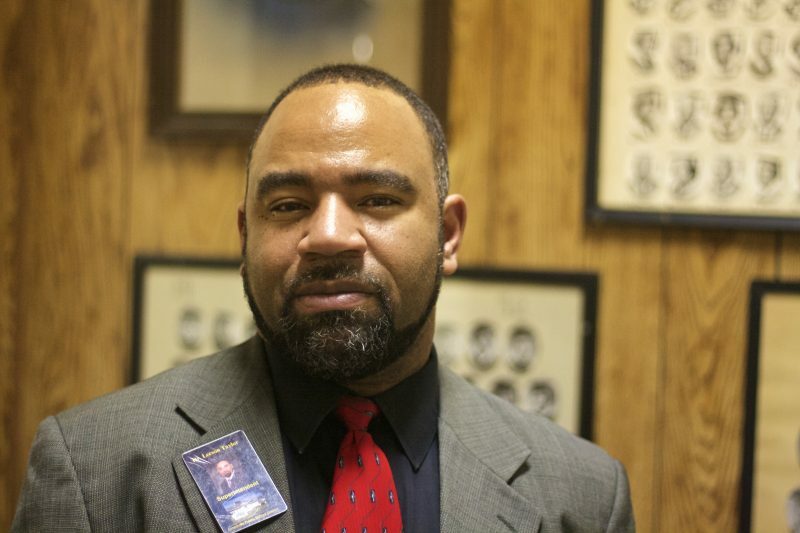 The town’s first black male mayor was elected last January with nearly three-quarters of the popular vote. Errick Simmons, 39, is widely considered the next best hope for Greenville. The young, ebullient homegrown lawyer with a penchant for brightly striped bow ties shows the early enthusiasm of a Delta-style Cory Booker. Errick graduated from Greenville public schools in 1995, losing the valedictorian honor by a whisker to his twin brother, Derrick, who is now a state senator in Mississippi. Errick earned a law degree from Howard University and came back to his hometown with a zeal to give back. One of his first acts as mayor was to remove from public buildings the Mississippi state flag, the last in the nation to include the Confederate battle flag. Another was to announce a $9.1 million renewal of the former Sears Roebuck building downtown. Using federal and state tax credits, the plan is for mixed-use retail space, a boutique hotel, and a restaurant. All concede that a struggling, poorly funded school system does not help recruitment. Superintendent Taylor has made some minor strides in his four years on the job, despite having begun his term on damaged ground. He followed a corrupt superintendent, Harvey Franklin Sr., who is currently serving a six-year prison term for taking more than $270,000 in bribes and kickbacks from a reading company. Under Taylor, the high school graduation rate has gone up from 48 percent in 2012 (a figure he believes was miscalculated) to 72 percent for the class of 2016. (The Mississippi Department of Education, using older data gathered in 2014, put the rate at 58 percent.) Taylor added 10 Advanced Placement courses, and a comprehensive social services program to offset some of the barriers of poverty. Improvements, yes, but not yet enough to move the district up from its D standing in the state. The Mississippi State Legislature has not helped much. Its session ended this April with an education budget that once again shortchanged its funding commitment, this time by $172 million, $1.9million of which would have been Greenville’s share. For the last nine years, the state’s schools have been underfunded by nearly $2 billion from the Mississippi Adequate Education Program, a reform passed in 1997 in response to vast education inequities between poor and not-poor districts. The schools have only been fully funded four times in the last 16 years. “For a high poverty district like Greenville, MAEP underfunding is devastating,” said Matt Williams, of the Mississippi Center for Justice. Poor districts dependent on federal and state dollars do not own alternative local resources for things like yearly teacher salary increases when state funding is flat. Greenville suffers from one of the state’s highest teacher shortages, and one of the lowest starting salaries — $36,000. This year there were as many as 40 teacher vacancies at one point. One junior high, T.L. Weston, had to patch in a math teacher via web-conferencing for a period of time.